If you don't want to convert your HTML documents online then you can choose to download a Free HTML to PDF Converter Desktop Application to convert the HTML documents right on your computer without installing any other tools. The Free HTML to PDF Desktop Application allows you convert HTML documents, web pages and HTML strings to PDF and to images in various raster formats like bmp, jpeg or png. If you want to convert HTML documents to PDF but you don't want to upload your documents to an online service then this desktop application is the perfect solution for you. It does not require installation so you don't have to change anything in your computer configuration and does not rely on anything installed on your computer. It is a simple application for .NET based on our HTML to PDF converter library. The Zip archive of a product can be extracted in any folder of the file system. The archive contains an executable file which is not installer, is a .NET Windows Forms application. This application does not make any configuration changes on your computer and you can use it directly to convert HTML pages to PDF documents and images. You can see below how the user inteface of the application looks like. To completely uninstall the software from your computer you have to simply remove the folder where you extracted the files from archive downloaded from our website. There is not an uninstall program because no changes were made in your computer configuration during installation process described above. When download the software from our website you implicitly agree with the terms and conditions from this End User License Agreement. Please read carefully this agreement before downloading the software on your computer. We guarantee that the application you download from our website is verified to be safe and to not make any changes or damage to the computer where you run it. The software does not need installation being delivered in a zip archive and therefore it doesn't need uninstall either. 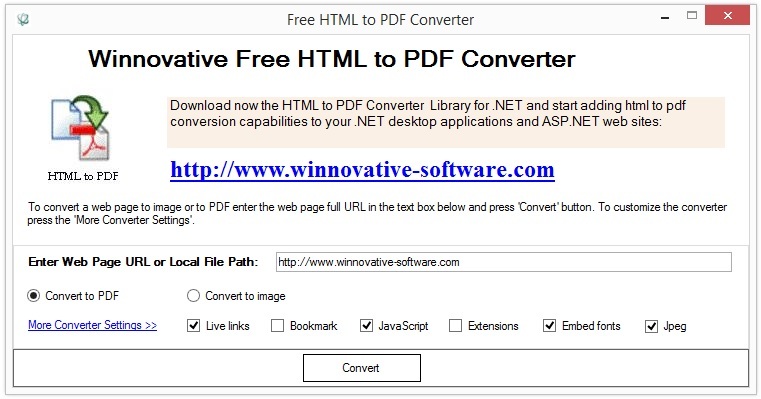 You can always create your own HTML to PDF Converter application using the HTML to PDF Converter Library for .NET.